The innovative On Screen Keyboard has opened a new way of input to the PC world. 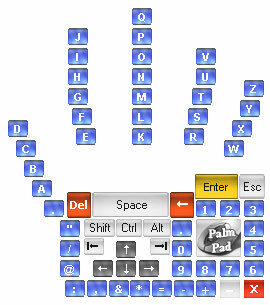 The Palm Pad provides the users to input text and control their Text Editor or a Web Browser with ease of one hand access even without a single click of the mouse. Users can move the mouse pointer over the keys and they can type the key to the active window. All the necessary keys in a standard keyboard are available at the shortest reach of your mouse. * No more Typing ! * No more Clicks ! * No more Pain in your hands. * Don't make any noise while you type. * Reduce your Stress and increase your Concentration. * Type while you eat. * Type a web address or navigate a page. * Edit your documents single handedly. * You can do all these with a bun in your hand. * Easy access to the keys. * Stylish design with glassy transparent buttons. * Beeps different sounds when a key is activated. * No need of speakers to hear the beep. * Sound can be switched on/off as you wish. * Dragable pad which stays on top of your applications. * Covers only a small area of your screen. New text editor to include both an image viewer and a word processing function. Palmary Clock is a full-featured clock with skin and background support. DocPad is a superior alternative to Notepad. Qweas is providing links to Palm Pad 2.0 as a courtesy, and makes no representations regarding Palm Pad or any other applications or any information related thereto. Any questions, complaints or claims regarding this application Palm Pad 2.0 must be directed to the appropriate software vendor. You may click the publisher link of Palm Pad on the top of this page to get more details about the vendor.